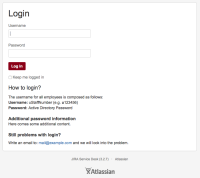 [JSDSERVER-330] Customizable text Service Desk login pages - Create and track feature requests for Atlassian products. We are aware that this is important and something our customers expect. The good news is that, this is a priority in our short term roadmap and we're currently investigating ways to make this available to our customers. Whilst I’d like to give you a clear timeframe for when we can deliver this, unfortunately, I cannot make such indications at this time yet. We’ll keep you posted as we progress. Product Manager - Jira Service Desk. 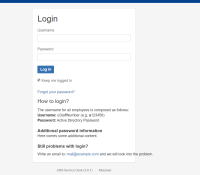 Change the text per Service Desk to give the user some hints what is the login or where they can get access.